This week Target’s interim CEO, John Mulligan, announced “starting today we will also respectfully request that guests not bring firearms to Target – even in communities where it is permitted by law.“. It seems Target’s new CEO is trying to have his cake and eat it too! He seems to be pandering to the Anti-Second Amendment crowd with language they can interpret as they want; or if they aren’t that blind then they see this as a step in the right direction. Molly Snyder, a Target spokeswoman, said the retailer will not post signs at its stores asking people not to bring guns inside. “It is not a ban,” she said. “There is no prohibition.” She said the company decided to make this statement after hearing from people on all sides of this issue. I have to say this is probably the biggest non-story ever, yet everyone seems so excited. I mean Target might as well have announced they are changing their logo from white and red pattern to a red and white pattern! Fortunately, absolutely nothing has changed and you can still carry your legal self-defense weapon while shopping. Since this story is a great opening to discuss the effectiveness of guns for self-defense/preservation. And the Anti-Second Amendment crowd always seems to fall back to the “that is what we have police for” argument, followed by plugging their ears and repeating, “nah nah I can’t hear you“. We have to be honest, the Anti-Second Amendment “supporters” are using emotional arguments that do not hold up to logic. Unfortunately not many people use critical thinking and get caught up in the emotions of “gun violence”. This is nothing new, manipulators use emotions to motivate/influence a crowd. But what about the claim that we do not need to protect ourselves, because we have a dedicated Police Force? Rules do not make the world safe. Rules set a standard for all of us, I am not against rules. However, rules do nothing to keep us safe; look at all the mass shootings, all of them have occurred in “Gun Free Zones”. You don’t read about the shootings in other places because typically someone with a gun stopped the shooter. My point is if you depend on the rules, the law, to keep you safe you will be greatly and perhaps fatally disappointed. The Police cannot be everywhere, nor do I think we want them everywhere, that is however what the men in the second row of the image want, total control. In Ancient China and Japan it was against the law for citizens (the working class) to possess or learn to use weapons. Over the course of centuries the people taught themselves how to defend against the government oppressors, but at great human cost. Thankfully today because of their efforts we have the Martial Arts, Karate, Kung Fu, etc. Their techniques were appropriate and while disadvantaged effective given the weapons of the time. Guns changed all that. Any Martial Artist or Self-Defense expert will tell you, if you face a gun, comply unless you feel that regardless the outcome will be fatal; even then you have to be within arms length to have a prayer of survival. That only applies against a single gunman. What can the masses do against a dozen without massive human sacrifice and still no assurance of victory. Given the weapons of today our only protection in some situations and always against a government are guns, even then with the advanced weapons available that is questionable. But better to have a chance then stand as sheep before the slaughter. Self-Defense is a choice; it is a Right, a Natural Right. If you want to give up your right, to place your well being in the hands of another, please do so, but do not try to regulate the rights of others, to do so is to side with Evil. Nothing surprising here to anyone with a ounce of common-sense! Interesting this is confirming prior research from1997, proves that the facts/proof have been available which begs the question, if we know this and the proof is available why the huge push for gun control and weapons bans? Support of stronger restrictions on gun ownership is not supported by an exhaustive analysis of crime statistics. The people pushing for these restrictions are not back woods dummies, they are well educated people! Why would they ignore the facts? Why hide behind emotional responses and ignore the statistics, studies, and obvious fact that the vast majority of shootings occur in “gun free zones”. Could it be that there is a hidden agenda? There don’t seem to be to many other logical reasons for such an agenda. It is a power grab, plan and simple. The “powers that be” (UN, US Government, etc) understand that an armed populous is a limitation on their power and ability to push their agenda and control. History proves this to be true. The only province in the Soviet Union to successfully revolt ware the province of Georgia, why? Because their population had the right to carry musket loaders. This occurred during the mid-1900’s, not during the 1800’s, but the mere musket loader and a willingness to take significant losses enabled their successful and prolonged revolt. Afghanistan was and is another example of an armed population holding off and defeating a significantly larger and more advanced force (Russia and now US). If you can check your emotional response for a moment and think about the topic logically I believe you will begin to see the light of common-sense. Self-Defense is not just a personal issue, it is defense against tyranny in any form, be it personal, gang, vigilant, organized or government. With no protection your only course of action is to submit or die. The Martial Arts began in response to such tyranny, and still stand as the appropriate response to defend against physical acts of tyranny, but even the Martial Arts has its limit and facing a shooter beyond arms length is such a limit. 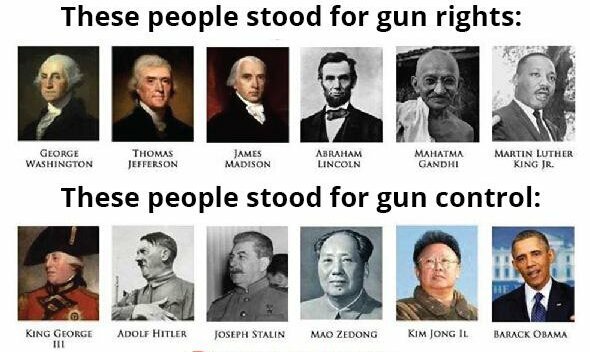 Stand for Freedom, Stand against Tyranny, Oppose Gun Laws and Restrictions. Meet Robert Steed, a resident of Vernon, Connecticut who took three days straight off work to attend several gun control hearings in Connecticut. There isn’t a lot I can add to his testimony. Robert Steed did a great job! I believe in reading between the lines, especially with politicians. First I thought to even bring a dictatorship up in the debate was interesting, but notice his wording at the end. …”We don’t want to go down that road” Wouldn’t it have been more appropriate (if you felt the need to even go there) to end with, but that will never happen in here, in this country. PS: I’ve been looking for a reason to use the world minions!! I wish I had more time to write on this topic as I (like most people) could write volumes of intelligent articles to battle the emotional response under-informed citizens seem caught up in. Since I don’t have a ton of spare time right now I wanted to share this video that covers all the major bases and mentions my home state, Connecticut! This is the most lucid, intelligent, civil, well thought-out objection to current Gun Control proposals.